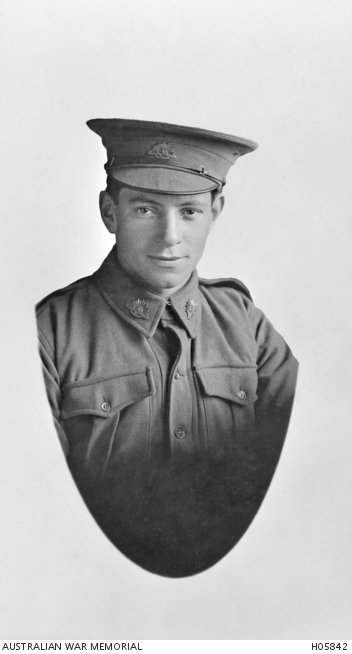 Studio portrait of 287 Private John Crichton, 18th Battalion (later 2nd Australian Pioneer Battalion), of Balmain, NSW. Son of Robert Stewart Crichton and Elizabeth Crichton. A miner prior to enlisting, he embarked from Sydney aboard HMAT Ceramic (A40) on 25 June 1915. He died of wounds on 12 December 1916 in the 9th Infantry Brigade, Field Hospital, Fargo, France, aged 23. He is buried in Heilly Station Cemetery Mericourt-L’Abbe, France. Subsequent to his death, he was mentioned in despatches for ‘good service rendered’.